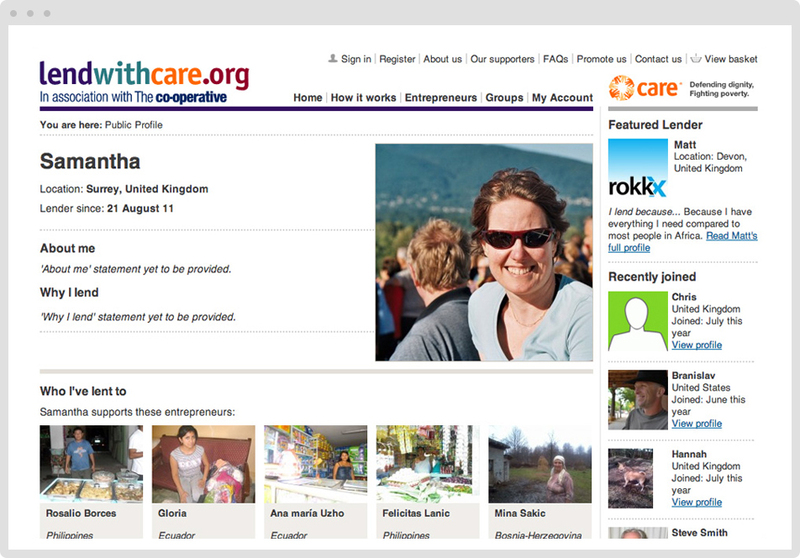 CARE International was looking for a new way to engage new supporters. What could we do? We asked people to lend, instead of give. CARE International runs savings and loans schemes in poor communities throughout the world. These enable people with a good idea to invest in a small business idea and grow it from there. 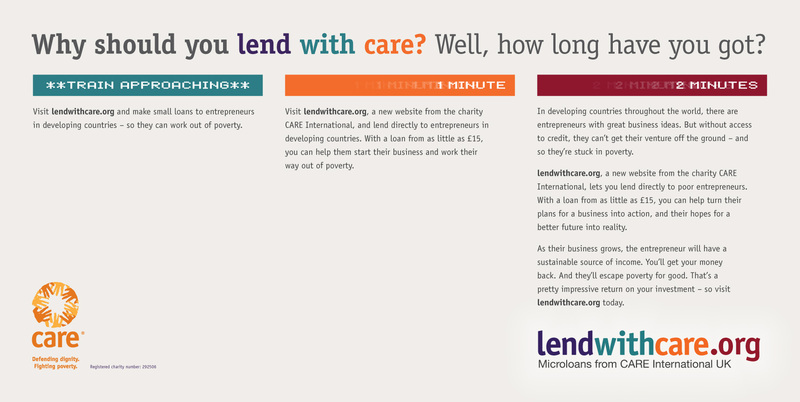 Working with CARE, we built lendwithcare.org. On the site, donors can see the business plans of entrepreneurs and choose which one they would like to invest in. Loans can be as little as �15. Some donors lend more or build a portfolio of entrepreneurs to support. When the entrepreneur repays their loan, the donor can choose to reinvest their money, withdraw it or donate it. 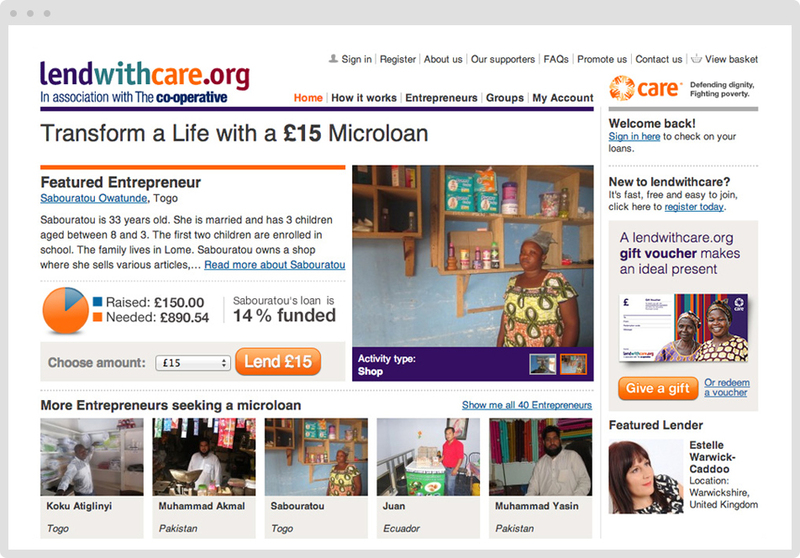 On lendwithcare.org, a supporter can read the business plans of entrepreneurs in the developing world. Then they can lend to an entrepreneur (loans start at just �15), to help get their business off the ground. As the entrepreneur grows their business and works their way out of poverty, the supporter�s loan is repaid. At the end of the process, they can either withdraw their money or recycle it, by investing in another entrepreneur. 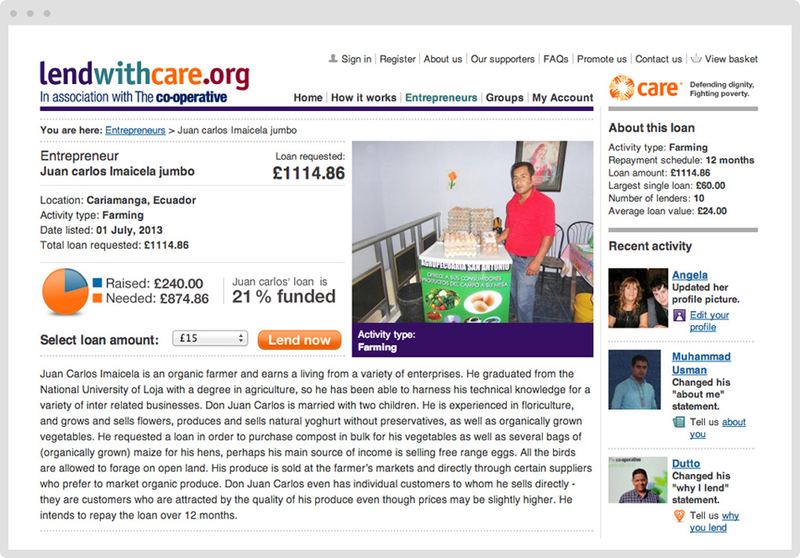 lendwithcare.org also enables the supporter to feel part of a community, by uploading photos of themselves and posting comments about why they lend. As part of the launch campaign, Bluefrog created a poster that appeared in Oxford Circus tube station during the busy Christmas period. Bluefrog also trained CARE International�s overseas partners to use lendwithcare.org, so they could upload photos and videos of entrepreneurs and organise repayment of loans. Lendwithcare.org has also received an award or two.